In a previous video I showed you how to make knitting stitch markers. There are times when you need a removable stitch marker for knitting and for crochet. I put together this video tutorial for you so that you could finish your collection of stitch markers. A removable stitch marker is great to dictate the right and wrong side of your work. It is also a great tool in crochet to hold your last worked stitch so that it doesn’t unravel while you put your project aside. Read to the bottom of this post to see the video for the removable stitch marker tutorial and the video for knitting stitch markers. 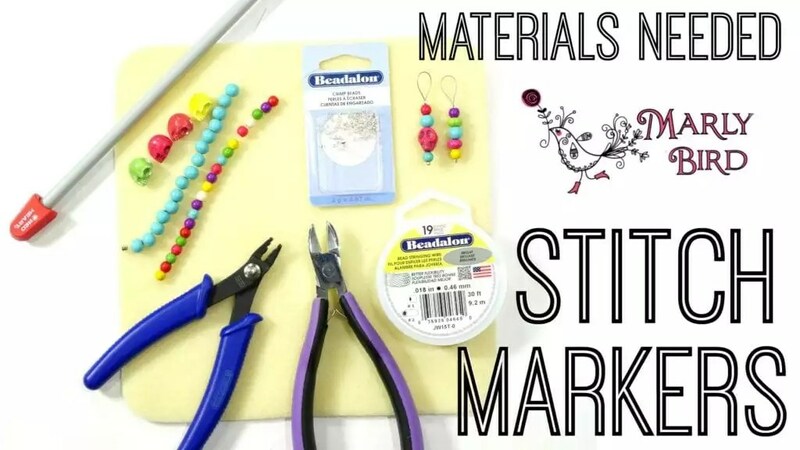 Let’s learn how to make a removable stitch marker. Making your own stitch markers is an ideal way to make something unique to your style. It can be hard to find large stitch markers which is a great reason to make knitting stitch markers. Once you make your own stitch markers for knitting you should also have some for crochet. The technique is the same for both sets of markers. The difference is in the way that you will attach the marker to your project. For the removable stitch marker you will use a lobster claw clasp, found in the jewelry aisle of your craft store. The lobster clasp comes in different sizes and colors so that you can customize your marker completely. If you make jewelry, or wear jewelry, you will likely know what a lobster clasp is. This allows you to open and close the marker so that you can move it around as you need it. This is a great option to mark the right and wrong side as well as hold your stitches from unraveling. Be sure to make a variety so that they can each mark something different. NOTE: I am NOT an expert in beading and I am not claiming that I know everything about the topic. I have put together this tutorial as a novice in beading, making something simple to fit my needs as a knitter. If you are looking for more information on beading or for inspiration you can check out my two friends, who are AMAZING jewelry designers. Jill Wiseman is an amazing designer and has her own online supply store. My other friend, Candie Cooper, is also a very talented designer. She has a Craftsy class to teach you all of the basics of beading. It is a great class that even shows you how to crochet with wire. My first time watching your video, and you’re my new favorite! I’m heading over to your YouTube channel right now. Thanks for a well-made tutorial.